The Washington Post is now the first news organization to purchase a “promoted trend” on Twitter, sponsoring the term #Election. The “promoted trend” will appear at the top of the list of current trends on Twitter with a yellow label clearly marking it as “promoted.” In addition, anyone who does a search for the hashtag will find a tweet from the Post attached to the top of the stream. This is an intriguing and aggressive move for a news organization and it’ll certainly be interesting to see if they can take advantage of the increased election conversation on Twitter to drive traffic. Twitter is also encouraging its users to report their experience at the polls by using the hashtag #votereport or #NYCvotes for those in New York City. 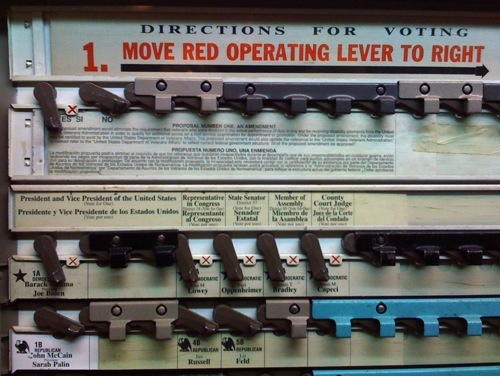 NYC had a lot of trouble in September with the new voting system they unveiled for the primary election. Twitter is pulling together all of this information at TwitterVoteReport.com. In addition to using Twitter the news startup TBD.com is encouraging its users to help map voting problems by using a piece of software called Crowdmap, as well as through email or submitting a tip directly to their website. Increasingly social networking sites are creating ways for users to make the act of voting a social activity. Foursquare is offering up an “I Voted” badge for those who check in at their polling place or “shout” that they voted. Foursquare is then visualizing the data in order to “encourage civic participation, increase transparency in the voting process and develop a replicable system for the 2012 Presidential Election.” Twitter is encouraging its users to use the hashtag #ivoted to remind their peers to vote. Facebook is joining in on the fun as well, reminding users 18 and older to vote today by posting a note in their news feeds and offering a polling place locator. As usual, The New York Times is going big: Its election maps and charts are elegant, intuitive, and work on the iPad. The Times has also created a neat visualization for exploring election traffic on Twitter. The addition of Nate Silver and his blog FiveThirtyEight to the Times’ politics coverage is sure to be an additional draw to those interested in making sense of all the polling data. Talking Points Memo also has an excellent election results app that’s also not dependent on Flash. This is fitting given that the number of TPM readers on mobile devices is growing. The Los Angeles Times has an intriguing news application that lets you explore the campaign contributions affiliated with Proposition 19, an initiative in California that would legalize possession and cultivation of marijuana. The app lets you explore the over $4 million in donations and figure out where it all came from. The Huffington Post is trying to make the midterms even more fun with a “Predict the News” challenge where users can make predictions race by race and then earn points for those they get correct. You can of course challenge your friends through Facebook and Twitter and compare results. In addition to their homepage, The Wall Street Journal is offering six hours of live video coverage on election night starting at 8 p.m. EST. The coverage will include “real-time news and analysis, live reports from key race locations, interactive maps, and features” and integrate with their iPad app. And as always there are a wealth of options for election night viewers, especially with many big cable channels and networks supplementing their broadcast coverage with online streaming. What else is out there? If your news organization has something exciting planned for tonight, let us know about it in the comments. Photo by John C. Abell used under a Creative Commons license. Diaz, Matt. "It’s election night: Here’s what some news orgs (old & new) have planned." Nieman Journalism Lab. Nieman Foundation for Journalism at Harvard, 2 Nov. 2010. Web. 19 Apr. 2019. Diaz, Matt. "It’s election night: Here’s what some news orgs (old & new) have planned." Nieman Journalism Lab. Last modified November 2, 2010. Accessed April 19, 2019. https://www.niemanlab.org/2010/11/its-election-night-heres-what-some-news-orgs-old-new-have-planned/.